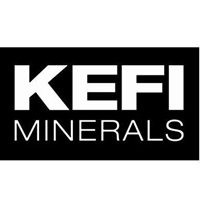 KEFI Minerals plc (LON: KEFI), the gold exploration and development company with projects in the Federal Democratic Republic of Ethiopia and the Kingdom of Saudi Arabia, is pleased to provide its quarterly operational update. This update encompasses the activities of KEFI Minerals (Ethiopia) Ltd and Tulu Kapi Gold Mines Share Company in Ethiopia, and Gold & Minerals Ltd in Saudi Arabia for the period from 1 January 2019 to 31 March 2019, together with more recent developments where appropriate. Since 1 January 2019, any material events have been reported in separate announcements which are referred to below, along with explanatory updates on those and other related matters. It has been a very important quarter for the Company. · Prime Ministerial go-ahead for the Project: Dr Abiy Ahmed, Prime Minister of Ethiopia, issued the remaining instructions for the Project go-ahead as announced on 5 March 2019. · Clearance of Community Resettlement: The Ethiopian Federal Government has approved the resettlement plan and the Local Government has now approved the compensation calculations. The Regional Government has begun triggering the consecutive steps of the resettlement programme in consultation with the community and TKGM. The current focus is on the selection of individual land-parcels, house locations and training. This is expected to lead to compensation payments in July 2019 for the phase one move of some 60 households, with the preparations being completed in the meantime. · Clearance of other administrative matters: The Federal Government consents have all been received from relevant Federal agencies other than some final aspects of the Project finance structure which has now been endorsed by the Prime Ministry. Details are being documented with the central bank which has issued approvals for capital ratios, hedging and bank accounts and we expect residual matters to be resolved shortly. * Ethiopian private sector partner ANS Mining Share Company Limited equity of US$38 million (Ethiopian Birr equivalent): injection of the first equity instalment of US$11.4 million will be upon satisfaction of certain conditions, as detailed in the announcement of 8 April 2019. * The plan will result in KEFI holding 81% of KME which will hold 59% of KGM. KEFI beneficial interest in TKGM thus being 45%. o These project equity figures ignore past investment of c. US$60 million. o The mandated US$160 million bond issue preparations continue. o Principal on-site Project contractors Lycopodium and Ausdrill have re-affirmed the 24-month development schedule and the 18-months thereof that commences in Q4 2019, after the wet season and phase one community resettlement. In the meantime, various engineering and contractual tasks are in process including detailed scheduling and updating of front end engineering and design. o Principal off-site Project contractors Ethiopian Electrical Power Corporation and Ethiopian Roads Authority have had budget approvals for their works and are preparing their sub-contractor tender documents for off-site infrastructure. Their work has started because their deadlines are of a critical path nature to allow plant commissioning to commence in Q4 2021.
o The preferred transport contractor is finalising route surveys for deliveries. * £969,000 equity placing completed, as announced on 21 February 2019. * Initial £2 million working capital loan facility (convertible at no less than 2p), as announced on 30 October 2018, not yet utilised. * Once TKGM becomes financially self-sufficient, KEFI-borne direct costs will contract back to c.£1 million p.a. (plus any commitments to exploration as it is started-up in parallel with construction at Tulu Kapi). * Capital inflows to KEFI are available under the working capital facility (maximum of up to £4 million, convertible at no less than 2p) and some cost-recoupments (estimated at £2 million) at full finance closing for TKGM. · The latest Project finance plans provide for equity-funding of the first six of a twenty-four-month program. The important consequence of this is that cash can build up before first lease-payment i.e. cash can build to a projected c. US$80 million from a projected c. US$40 million. · Likewise, gold in ore stockpiles is also projected to increase, providing further “margin of safety”. * Estimated average TKGM EBITDA of US$72 million (£55 million) over 8 years and annual debt-service costs during production of US$28 million (£22 million) over 8 years. o During 2018 Ethiopia emerged from two years of states of emergency and is undergoing a rapid and progressive transformation. The Ethiopian Government continues to push through an overhaul of regulations for various prioritised sectors including mining, to expedite development. o TKGM is the first major development for decades and has been honoured to be invited to be the industry representative for the Ethiopian Extractive Industries Transparency Initiative. o TKGM will start examining development scenarios for the 5-6 g/t underground deposit once construction of the open pit is underway. o KME’s exploration programs over its 1,900 sq km Tulu Kapi district areas will also trigger when major works start at Tulu Kapi. In the meantime, reconnaissance has commenced of the various already-drilled mineralised zones for follow-up. o The new Saudi Government continues to overhaul of regulations for the extractive industries, to expedite development of what it targets to be the third pillar of its economy. o G&M has, over the past few years, positioned itself as the only long-standing explorer with a large exploration portfolio and non-Government-controlled. o Hawiah is part of the 120 km long Wadi Bidah Mineralised District (“WBMD”) that is under licence or application for G&M. It contains 24 mapped Volcanic Massive Sulphide (“VMS”) systems for exploration, which will start in Hawiah. o The exploration team is in the field conducting trenching and geophysical surveys to follow up high-resolution multi-spectral satellite imagery analysis, in preparation for initial drilling in Q3 2019 of high priority copper-gold targets. · The Jibal Qutman Project: this gold discovery of G&M sits within the regulatory authorities as an application for a mining licence and has been relegated in short term importance for G&M vis a vis WBMD. · An announcement will be made providing details covering this and related programmes in due course.